There's no question that Taylor Cochrane is a witty lyricist. The former lead vocalist of the Kronic Groove Band displays considerable wordsmithery on his debut solo album, Acoustic, on which he bursts forth with a collection of songs spanning the range from youthful cockiness to eccentric self-reflection. Sonically and lyrically reminiscent of The Passionistas, Cochrane steers clear of standard melodic formulae, leaning instead toward a more free-form approach within each song. As a whole though, the album is consistent, as one might glean from the title, in its acoustic approach, with a mixed degree of success. I found myself wishing that certain tracks had been fleshed out beyond the singer and strumming guitar reality, imagining the impact that they would have had with a bit more substance from a backing band. The tracks on Acoustic focus heavily on quirky matters, the unapologetic irreverence of a young man. From the name-checking on the opening track, Narcissism and Yellow Fever, to the references to song-writing that pop up throughout the album, self-awareness is the predominant focus of this collection of rather eccentric songs. In an curious shift from the standard practice, some of the more interesting tracks reside in the bottom half of the album. From the surprisingly irresistible singalong chorus about murder on I'd Hit That to the equally surprising self-reflection on Hypocrite, Acoustic turns an inward eye on the raw emotions that lie beneath a cocky persona. 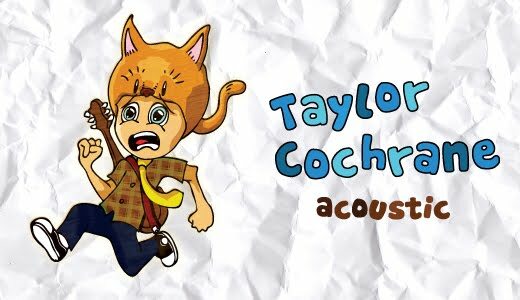 Although lacking some of the musical sophistication of equally novel musicians like Flight of the Conchords, Taylor Cochrane shows promise. He certainly knows how to turn a clever lyric. Keep an eye out for him.